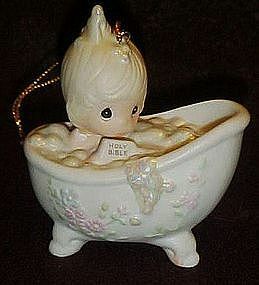 Made by Enesco, this Precious moments ornament is a sweet little PM child in a bat tub full of bubbles, titled "He cleansed my soul. No production mark but is stamped into the mold with the signature of Sam B. (Sam Butcher). This piece was first issued in 1987 and retired in 1999, #112380. No listings for this piece marked with the signature like this. Perfect condition, no box.